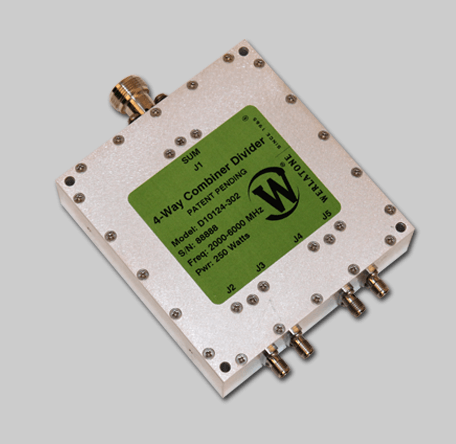 A new addition to our 2 to 6 GHz family of products, the D10296 is a High Power 4-Way Combiner/Divider, conservatively rated at 200 W CW. Measuring only 3.9 x 3.6 x 1.06", the D10296 operates with low insertion loss, high port-to-port isolation, and is designed to handle a full input failure, at rated power. A new addition to our 2 to 6 GHz family of products, the D10296 is a High Power 4-Way Combiner/Divider, conservatively rated at 200 W CW. Measuring only 3.9 x 3.6 x 1.06″, the D10296 operates with low insertion loss, high port-to-port isolation, and is designed to handle a full input failure, at rated power.